Pre-Review Note: The following review is, by my own admission, one of the most ill conceived critiques I have ever written. It may be the worst review on the internet. While I should mention I don't think this movie is anywhere near as bad as some people claim, upon further viewings (and having a few years of wisdom under my belt) it is pretty apparent this is not a good movie. Two stars would be a much more fair grade, and the idea that any of the performances were worthy of Oscar nominations is so laughably bad I'm amazed I've been doing this as long as I have been. I would feign ignorance by being a mere teenager when I wrote this, but really, there is no excuse. I was a fanboy writing a fluff piece. The review mains a fluff piece to this day. I also don't believe in re-writing history, and thus, my mistakes are here to shared with the world. In the future I may do a re-evaluation and update my review, but for now we must live with the mistakes, and I try not to hide my mistake but to learn from them. I'm so terribly sorry for what is about to follow. 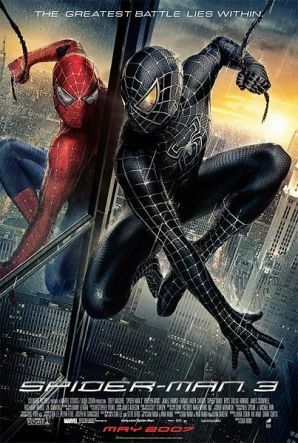 There is only one downside to this movie being so good, and that downside is that there is NO WAY "Spider-Man 3" will be any better! This is a line I wrote in the closing passage for my review of “Spider-Man 2,” which I believe is not only the best superhero movie ever made, but also one of my personal favorite movies of all time. It received one of my very rare A+ reviews (or five stars if you’re reading me on Amazon.com)[Editor's Note: Years ago the side used a letter grade system as opposed to a star grade. ], and was not only a great comic book adaptation for the big screen, but it was a great movie PERIOD! 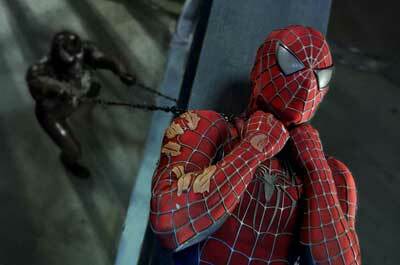 Don’t let naysayers tell you anything else, “Spider-Man 2" was a masterpiece of great storytelling and human emotion. Whether it was intentional or by accident may be up for debate after you see “Spider-Man 3" though, which takes place a couple of years after “Spider-Man 2,” and finds Peter Parker’s life going great. He’s loved by the public, no super villains have shown up recently, and...oh yeah, he’s got a girlfriend with Mary Jane Watson, the pretty redhead. Things are going so good in fact, that Peter decides it’s time to ask Mary Jane to marry him, a decision that prompts Aunt May to share boring stories of her love life when she was his age. Before Peter can pop the question though, Harry don’s a green suite to become the New Green Goblin, and attempts to kill Peter before he bumps his head and suffers amnesia (he’ll lose and recover his memory several times throughout the movie). Sandman makes an appearance as a fugitive trying to get money to try and heal his sick daughter, where we find out it might have been HIM that actually killed Uncle Ben! To top everything off, a black alien goo attaches itself to Peter which gives him a dark suit, and turns him to the dark side, though the dark side ends up making Peter look more dorky then he otherwise would have looked. Being a $300 million dollar movie, you can expect action sequences that are spectacular to watch. One includes a piece of construction equipment going out of control and causing much destruction to everything, a fight with Sandman involving trains (or subways), and VENOM...who, I’m sad to say, is such an afterthought in this movie that he is neglected to be given a name for newcomers to identify him with! Oh yeah, and Gwen Stacey makes an appearance because Peter’s crime fighting isn’t complicated enough, so the producers decided to complicate his love life as well. What the movie really manages to complicate though is the audiences reaction to the movie. Superhero movies are tricky to review in the sense that they walk a very fine line between being glorified fanboy productions and legitimate works of art. 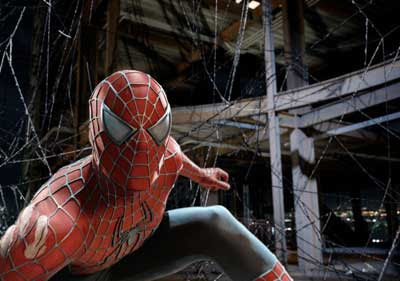 “Spider-Man 2" set the bar extremely high in both these regards, as a film that was perfect as both a superhero film AND a movie for non-comic book fans, a feat “Spider-Man 3" doesn’t come close to accomplishing! In fact, it misses the mark on both fronts. As a comic book adaptation, fans will be scratching their heads as to why so much is thrown in the movie without anything done with them. This includes the addition of Gwen Stacey, Venom, Eddie Brock, Sandman, and Mary Janes jealousy of Spider-Man (makes sense in the movie). Non-comic book fans won’t be able to keep up with the movie very much at all I suspect, seeing as how most of the people who don’t read comic books were even aware Venom had a name in the first place. Why didn’t the producers hold off on Venom until movie four? Why did Spider-Man have to have the black suit on this film in the first place. Gwen Stacy does nothing in this movie, but if she dies in the next film (and she most likely will) wouldn’t that be a very dramatic event for the black suit to feed off of Peter Parker in movie four? Why must we re-open the Green Goblin storyline. Is William DaFoe contractually obligated to make a cameo in every Spider-Man movie, whether he has anything to do with it or not? If they’re throwing all this in, maybe an extra thirty minutes of story added to the movie could have helped with the traffic in this film. On the other hand, this movie is already two and a half hours long, and most people just don’t like to commit to a three hour film (much like they have trouble committing to a three month relationship). From what I hear Sony has plans to make up to six Spider-Man movies, and chances are movie four will be green lit within the next couple of weeks (Editor's Note: That's a personal guess of mine, as Sony has made NO such announcement on this at this point in time). Hopefully next time around we’ll get some traffic control, a few less villains, and more intimate characters to watch. To be blunt, this movie is a mess and a big disappointment. But boy, despite the fact that this is a mess, it sure is a pretty mess! Parents, there are a couple strong curse words, but no sexual content and the violence is very stylized. Recommended for ages 12 and up.